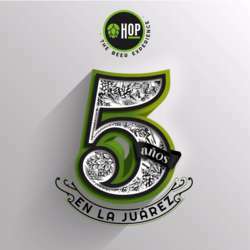 Join us in celebrating 5 fabulous year of Hop the Beer Experience! This place holds a very special place in our hearts as it is where this group began. One of the very first Beer Enthusiast events was hosted by Hop the Beer Experience and we would like to invite you to join us in cheers-ing to their 5th anniversary. The Juárez location, where the event will take place, has recently been remodeled and best of all, more taps have been added to the menu! On this special occasion, our group will receive 10% off all beer and food from Protected content so be sure to arrive on time. Hop the Beer Experience is described as a relaxed place to chat with friends and drink good beer accompanied by good food. You may even find the love of your life here! At our first event at Hop, some of our dear friends met, fell in love, married and now have formed a family of their own. May you be as lucky as they were! Please join us for our exclusive 5th anniversary celebration at this must visit location.